Today I take you to the beautiful city of Bangkok—a city vibrant with life and with people who are always very cheerful. This post was long pending because I had visited this place 1.5 years back in September 2013, but did not get much time to frame all the details in one place. I have uploaded some photos though in my blog few weeks ago. 1. Wat Pho : My trip for Bangkok started on the 3rd day, after bidding farewell to the beach town of Pattaya. 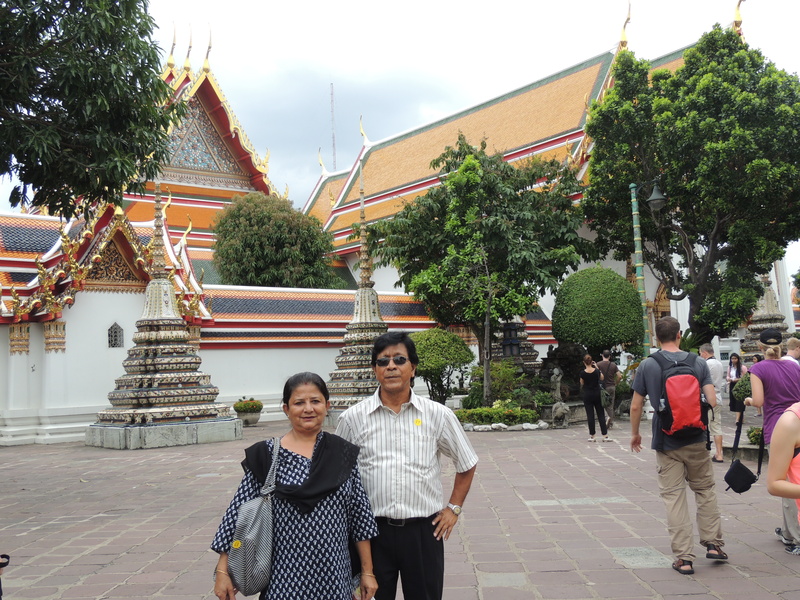 Our tour operator made all the arrangements and we headed towards Bangkok in a taxi, along with fellow tourists. Before checking in to our hotel, we were taken for a tour of Wat Pho(Temple of the Reclining Buddha)-the Royal Buddhist monastery which houses one of the largest reclining Buddha statue in the world of 15m height and 43m length. The monastery was crowded with tourists and mostly you can see Indian people as Thailand being very much near to India and affordable, makes it a favourable destination for many. The premises of the monastery were very much well maintained. We needed to carry our shoes in a bag when we enter the main portion of the temple. 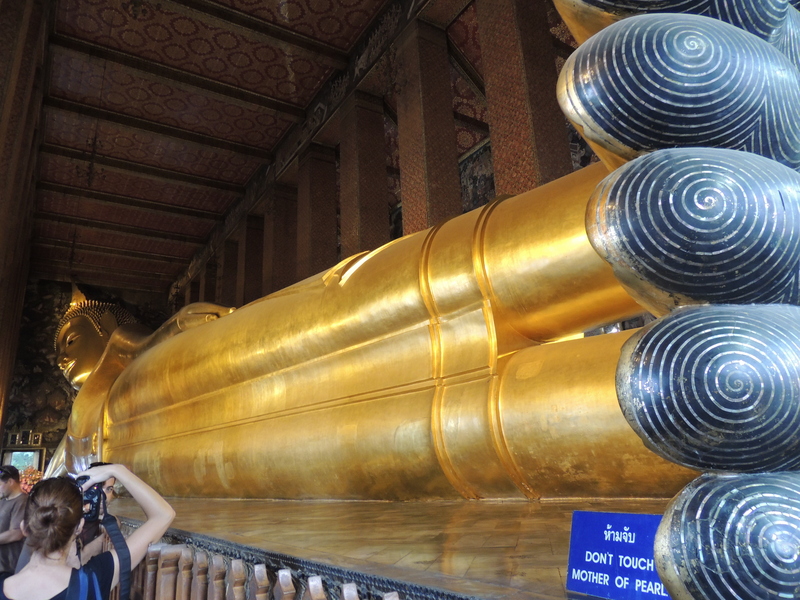 The sight of the golden reclining Buddha was just splendid. It exuded an aura of peace and tranquillity amidst so much of commotion. We dropped coins in the prayer bowls, and took a look around the whole campus which has more than hundred of Buddha images. 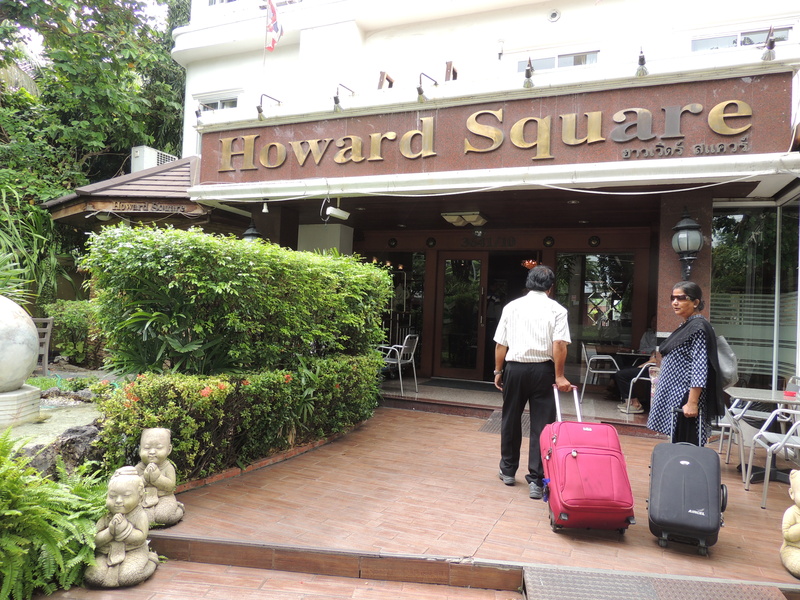 After a bit of sight seeing, we reached our hotel Howard Square, where we were booked in for our next 2 days of stay. 2. Madame Tussauds Museum : After relaxing for 2-3 hours in our hotel, we decided for an optional tour to Madame Tussauds museum in the Siam Discovery Centre located in the city. 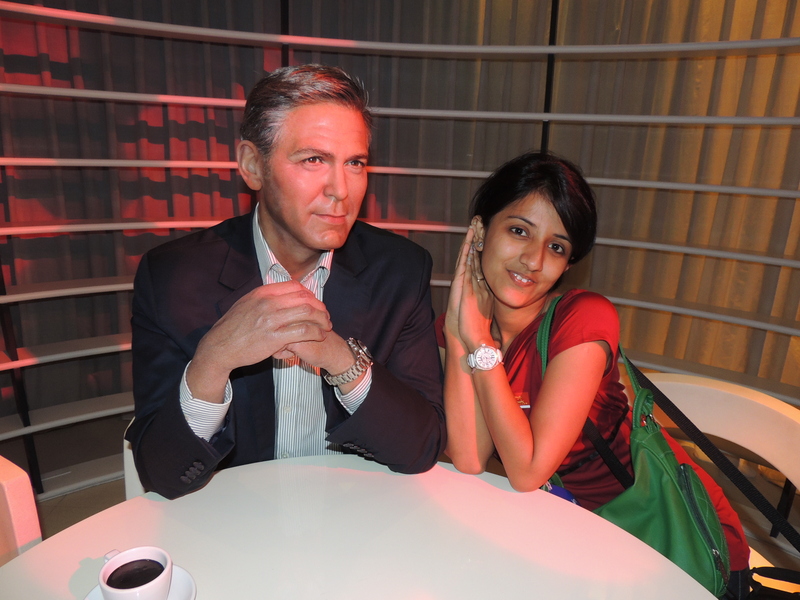 It is a wax museum with its main branch in London, founded by Marie Tussaud, who was a sculptor herself. 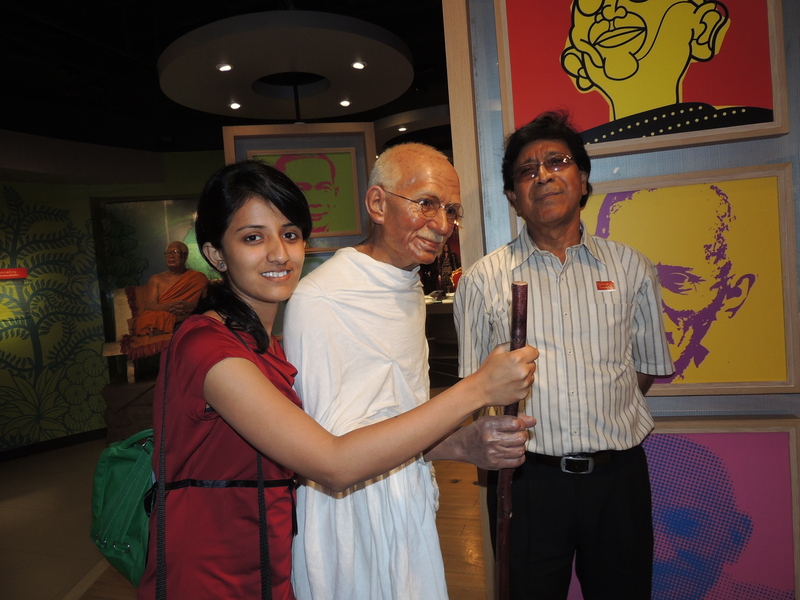 The museum houses the real size wax statues of famous celebrities and renowned personalities from all over the world. If you are in Bangkok, do not miss the chance to visit this awesome place and click some pictures with your favourite superstars, if you have not been to any wax museum earlier. I did not leave a single statue for posing around with 😛 . We took tickets, which now costs around 850 baht, approximately equal to INR.1700 per person. 3. 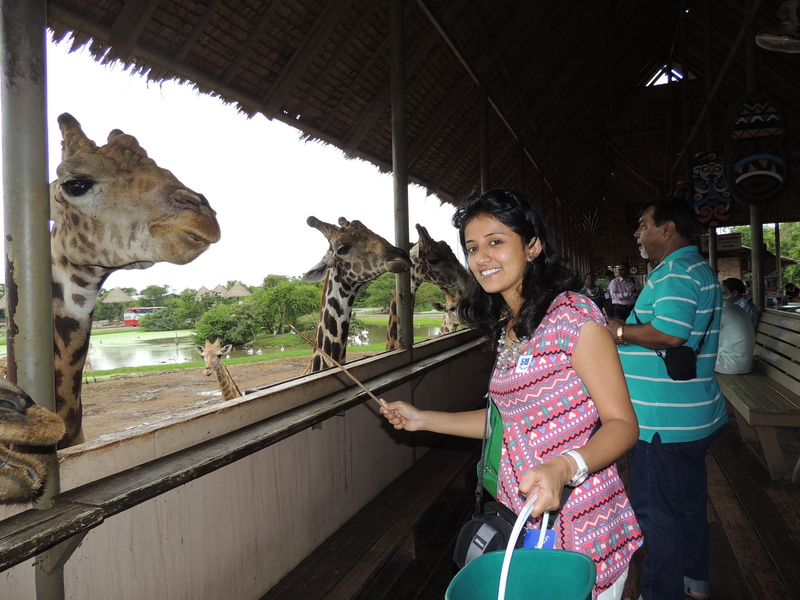 Safari World : The most favourite place of mine in the whole trip. 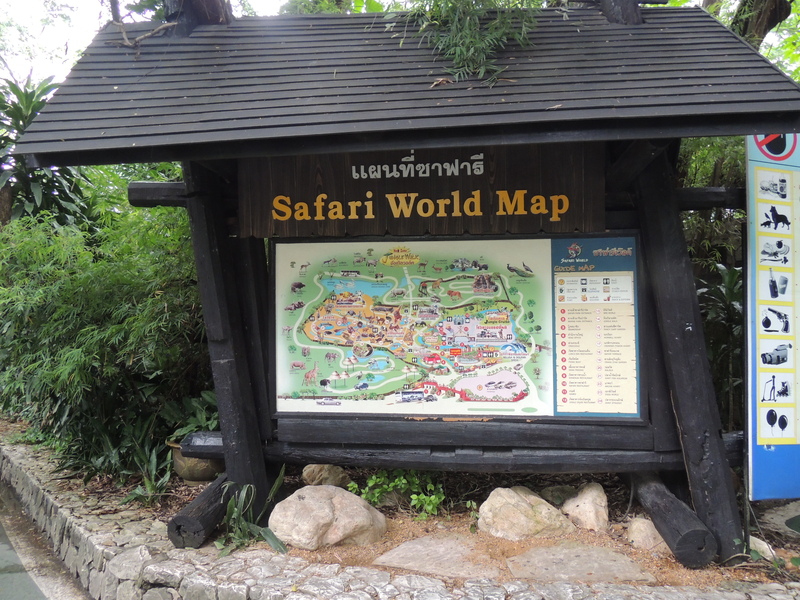 What can be most exciting for a person who harbour strong emotions for animals 🙂 ~~~~Safari world it is . We were taken in a taxi to the place and we gathered with fellow tourists to start our journey for half of the day. 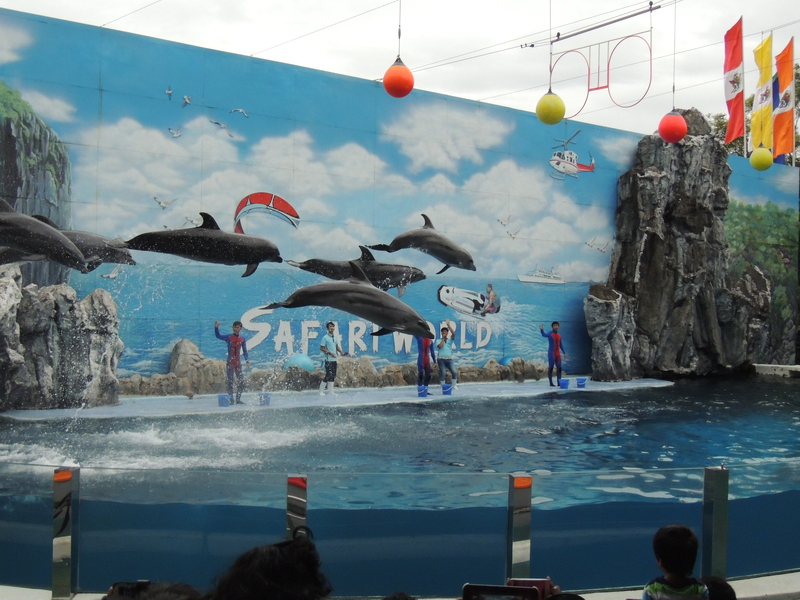 The Safari world consists of a Bird Show, Dolphin show, Orang utan show, Feeding Giraffe , Seal show and lots more. 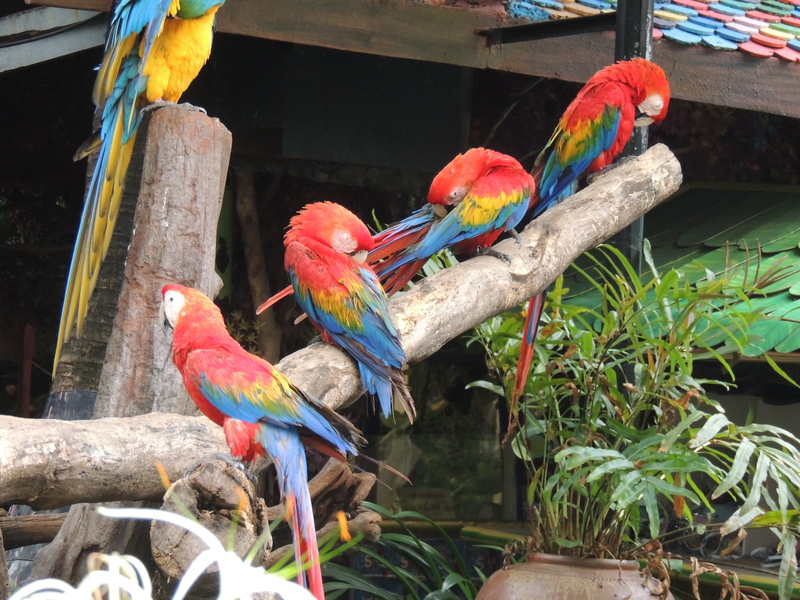 There was a Jungle cruise too, where we were taken on a ride to the sanctuary area to witness Lions, tigers, zebras, ostrich, deers, etc who roamed around in their natural habitat. I was at my happiest peak 🙂 . 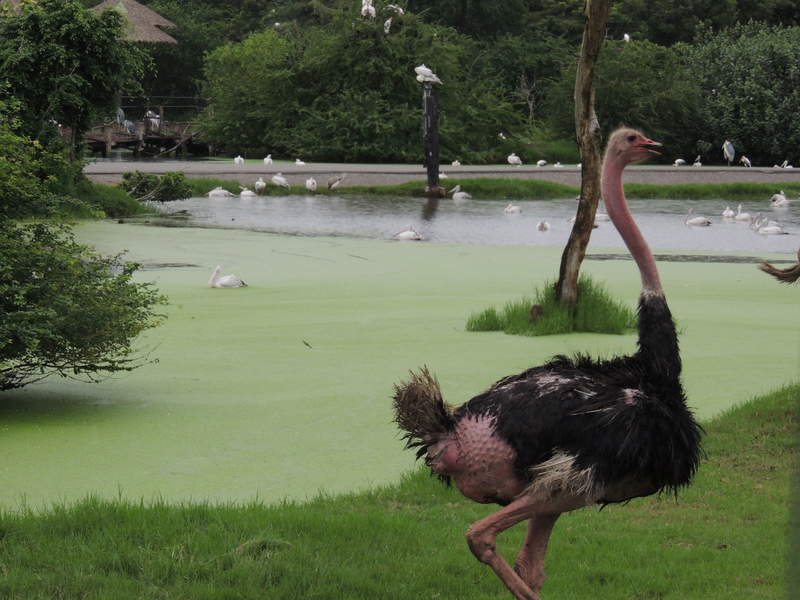 I was really impressed by the way of maintenance of the park. 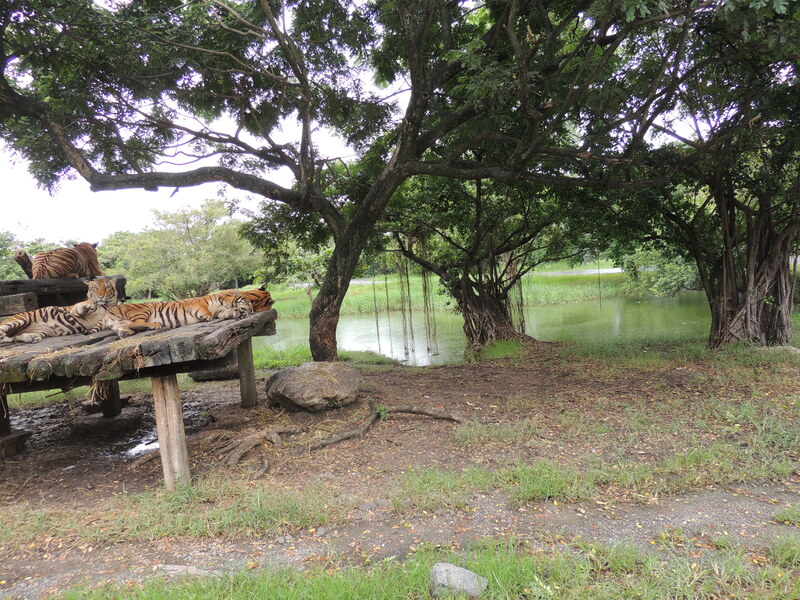 Kudos to the authorities, all the animals lived very naturally and were well fed, so that made me quite at peace. 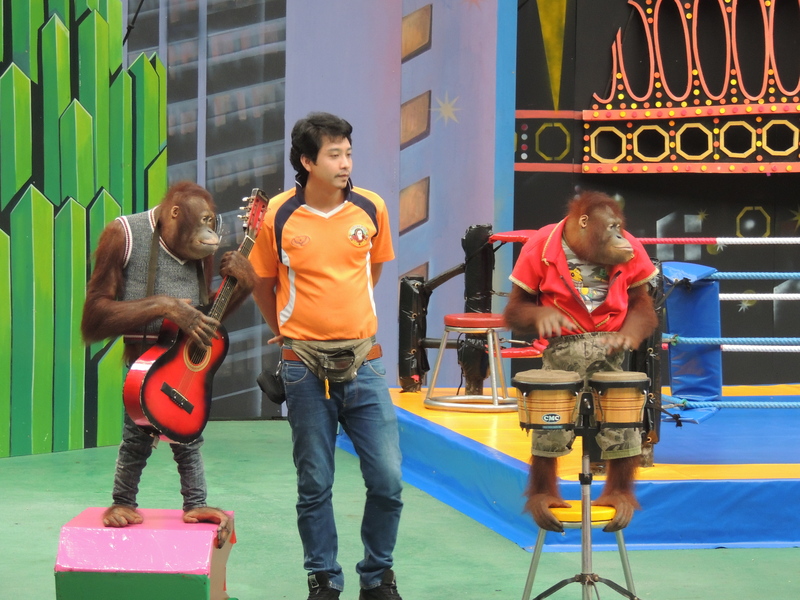 The Orangutans are just like humans, so very perfect in matching all tunes of the music show they were performing. They were dressed in supercool outfits and definitely swept the ground below my feet 🙂 . 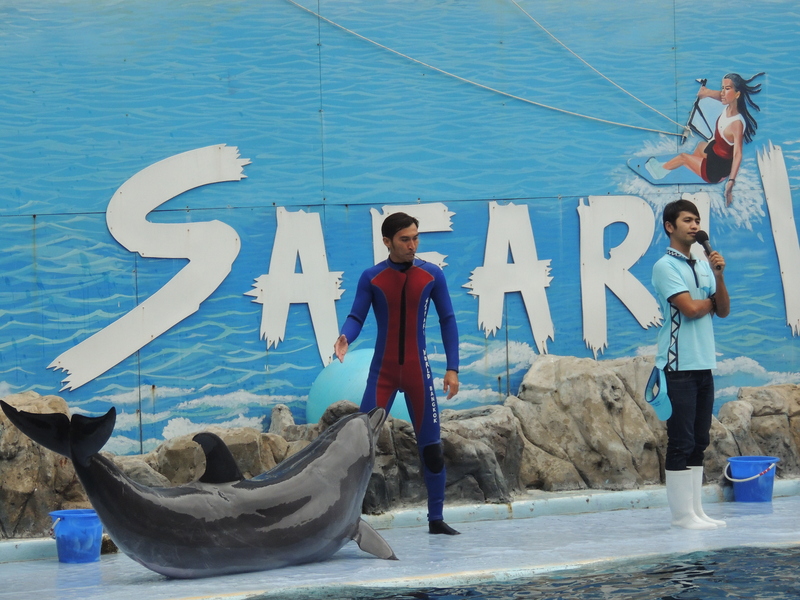 The Dolphin show was the most spectacular one. It very amusing to see so many dolphins showing stunts so rhythmically and perfectly. All are so well trained, but yeah they do need to be fed with 3 fishes every time they perform something 😀 . 4. Streets of bangkok : The later half of the day was spent roaming on the streets of Bangkok and doing some bit of shopping in Indira Square, very much perfect for Indian crowd. You get all sorts of wholesale goods, ranging from shoes, bags, clothes, electronic items to household goods. Visit to that place is a must if you want to take some souvenirs back home for friends and family. 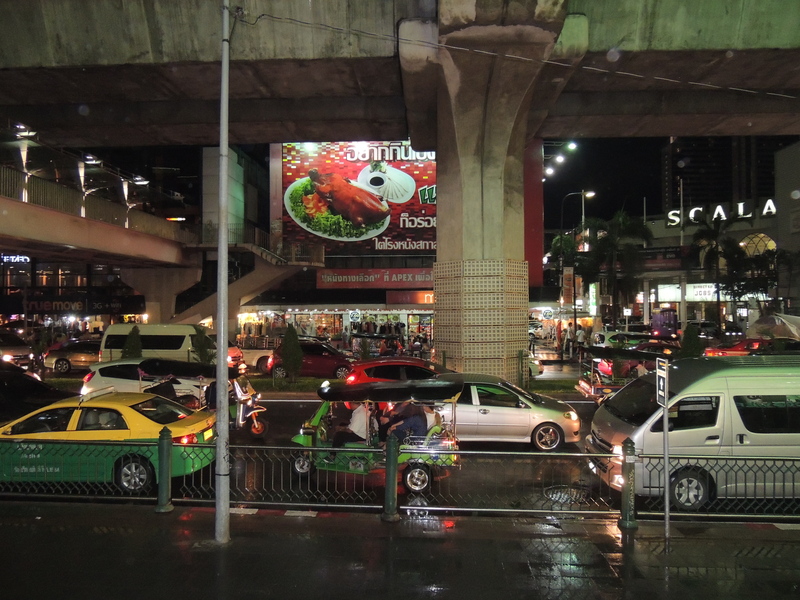 Traffic on the streets of Bangkok….can you see the famous Tuk Tuk?? With just 2 days in hand, I could cover only some parts of this vibrant city. I explored quite a bit—riding on the famous Tuk-Tuk auto,hoping out of a restaurant after being unable to explain what I wanted to have because of language barrier, picking up loads of items from Indira Square although it dug a hole in my pocket(girls can never leave shopping 😛 ),dancing to the tune of Bhangra in Safari World and lots more 🙂 . Overall the experience was very much enriching. 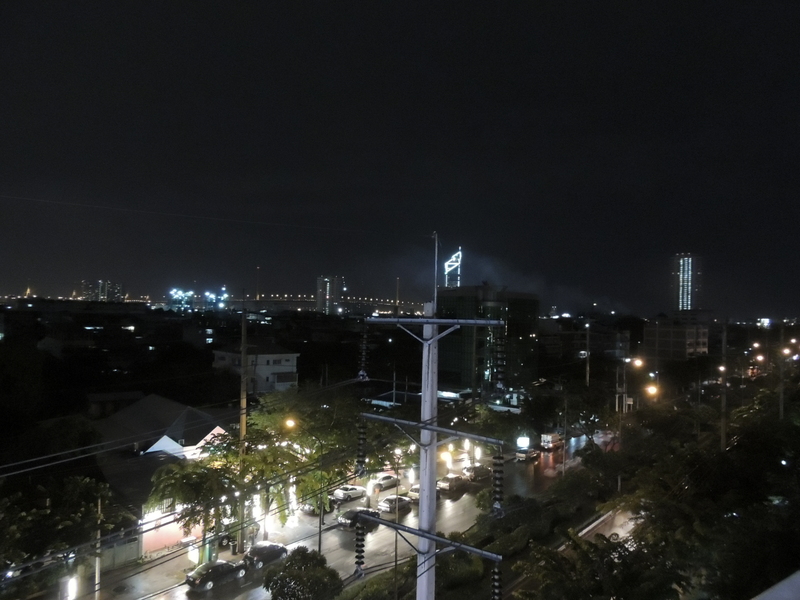 With a longing to return soon, I packed my bags for leaving Thailand the next day. Sawasdee Bangkok….see you very soon 🙂 .